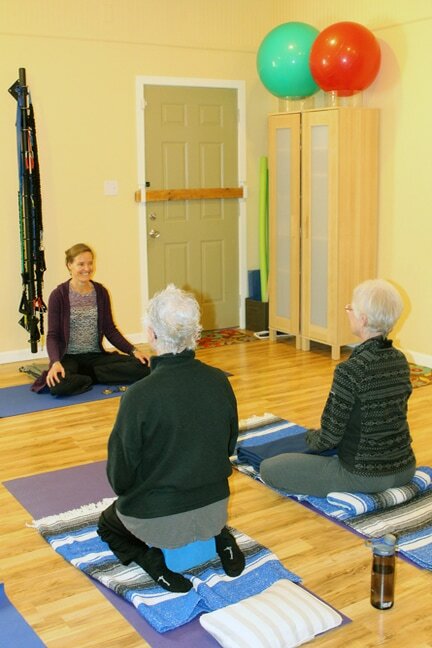 ​Susan Grote has been blending the practices of physical therapy and yoga for over 20 years. Referring to her work as “architecture of the body”, she has developed a unique multi-faceted approach to treatment that integrates her physical therapy skills, her gift for understanding the interconnectedness of the body, and her extensive knowledge of yoga, breathing, and movement. Susan has always been intrigued with the body and wellness. Interestingly, she started her career in architecture. Her natural aptitude for understanding structure, forces, and balance led her to study architecture at the University of Washington where she graduated with a BA in 1988. When she was introduced to yoga in 1990, she was immediately drawn to the depth of the mind-body practice and quickly realized she was more excited about working with the dynamic structure of the human body rather than buildings. Fascination with the body and movement as well as a love of teaching inspired her to leave architecture to pursue her long held interest in health and wellness. She began teaching yoga in 1993 following completion of a yoga certification program. To satisfy a desire for more in-depth knowledge of anatomy, physiology and biomechanics, Susan returned to the University of Washington and earned her Physical Therapy degree in 1996. In addition, she has continued her yoga training, completing a 200 hour certification in 2007 and an advanced 500 hour yoga certification in 2009. Since 1996, Susan has worked as an orthopedic physical therapist as well as a yoga teacher. She also shares her knowledge of anatomy and functional movement in the context of workshops, serving as adjunct faculty for yoga teacher training programs within Seattle. Her architectural training gave her the foundations to appreciate that forces can be directed through the body creating strength and power or causing strain, depending on the direction. She brings this understanding as well as passion for this knowledge to her patients and yoga students. With her emphasis on retraining movement patterns, balancing strength and flexibility, and harnessing the power of core strength and breathing, she has helped many make transformative changes to alleviate pain and rediscover balance.